Why keep going the same route when you should try to change things around so that you or your children have a better life? What if the Plexus Products can help you? Would you like to share this with your family? My mother and her brother grew up together but they live in two different towns now as an adults. They have the same health problems. 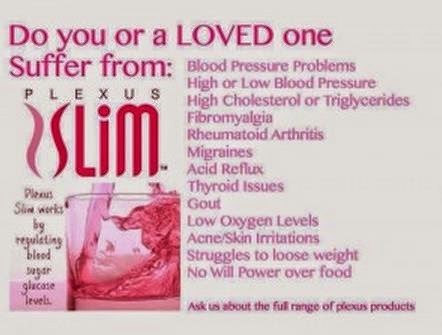 I don't like to see family or friends hurting or suffering so I share my plexus with them all. Now if your hurting and you were given the plexus products that just might help get rid of that pain that's all on you. That's what I tell them when I give them the products. I don't like to see anyone hurting. I'm a caring person, it breaks my heart to see anyone suffer. That is one reason why I will never work at a nursing home. I tried that once and the company made me sick because they didn't care to do right by the people. I love to learn about people, when I was working at the nursing home I spoke with some and they would tell me what kind of work they did. That was very interesting. If you were to join Plexus and it made a difference in your life. You think about your children and think about the family health history. Now with Plexus you can pass the company down to your children and they can keep it growing as well. There is no hard labor, no door to door sales, the only way that it could be hard for you and family to build your business is if you did nothing about helping it grow. I don't know about you but I would love to do what ever it took to make things easier in life for my children and family. Even my friends mean alot to me. All you have to do is share your health issues with others and tell them what has helped you and your family. How it has made a difference in yours and your families life? We are all here to help one another in any way we can. If you share your story you can help someone else maybe even make a big difference in their life. You just never know. Come and check out the testimonies, contact me if you have any questions about Plexus. Join my team if your ready to make a difference in your family health history. Thank you Terri for reading n making my blog the fmotd. Excellent blog post DeAnn about Plexus and may you be blessed with abundant success while you're helping people to be healthy.